You might have a fantastic financial history, but getting a mortgage can still be a difficult challenge. Whether you’re a first-time buyer looking for a mortgage, or a house owner hoping to save money; we can help. If you’re not sure where to start or have been turned down for a mortgage in the past, our guidance will ensure you avoid all pitfalls. Our fully qualified mortgage advisor will give you honest and reliable advice on the best steps to take next. Not only do we offer professional advice, but we also offer a range of mortgage solutions at competitive rates. Call us now on 01204 699002 to speak to one of our qualified mortgage advisors. With housing prices getting higher and higher every year, getting on the property ladder has never been harder. If you’re a first-time buyer looking for a mortgage in Rochdale, then we can guide you through the steps. Getting a mortgage might seem like a scary and daunting task but it doesn't have to be! 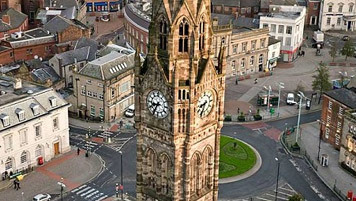 Rochdale is a town located a few miles northeast of Manchester, known as a boomtown of the Industrial Revolution, and one of the first industrialised towns. There days, Rochdale also boasts the Hollingworth Lake, which has attracted visitors for generations. With a population of 107,926, there’s no shortage of amenities and things to do – surrounded by vibrant countryside and within close proximity to most of the north's major cities, Rochdale is in the perfect location. The average price for a terraced house in Rochdale is £106,411, the average for a semi-detached property is £143,443, and for a detached property a buyer is expected to pay around £265,885. The ideal place for a first-time buyer looking to work in Manchester, Bolton, Bradford, or any other nearby cities. If you’re looking to buy your first property in Rochdale, then we can help. With our experienced mortgage adviser and competitive rates, we can help take away the troubles of your first buying experience. Call us now on 01204 699002 for trained, expert and friendly mortgage advice. Buying a property to rent in Rochdale has gained increasing popularity in the eyes of many investors. Not only is your property likely to increase in value over time, but it can also earn monthly rental income to help with your mortgage payments. If you wish to know more about how buying to let can be beneficial for you, then contact us today. Call us on 01204 699002 to speak to our qualified mortgage advisor who will be happy to answer any questions or queries you may have. Your property may be repossessed if you do not keep up with repayments on your mortgage. Not all Buy to Let Mortgages are regulated by the Financial Conduct Authority. If you’re a current homeowner, then you may benefit from remortgaging your house. Usually seen as something a person would do in order to raise capital, nowadays an increasing amount of people are remortgaging their homes in an attempt to save money. By remortgaging your house, you are in effect ending your current mortgage and starting a new one – with new terms. These days there are many mortgage advisors offering introductory rates and special offers, meaning you can often save money. If you’re curious to see if you can save money by remortgaging your home, then call us today on 01204 699002. Here at Rivington Mortgages, we’re proud to have won the “Best In” category at the Best of Bolton awards after our customers voted us the best mortgage broker and mortgage advisor in Bolton and the surrounding area - in fact, we were one of the top-rated advisors nationally! To experience our award-winning customer service and to see why we’re rated number 1, call us today on 01204 699002 for expert and friendly mortgage advice. Rivington Mortgages Ltd is an Appointed Representative of Stonebridge Mortgage Solutions Ltd, which is authorised and regulated by the Financial Conduct Authority. Rivington Mortgages Ltd undertakes credit broking and is not a lender. Copyright © 2019 Rivington Mortgages Ltd.